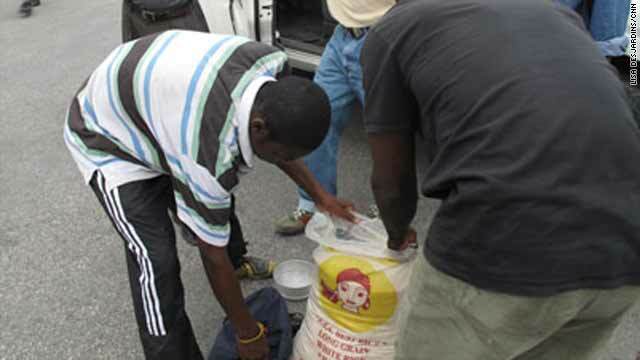 People collect aid in the form of rice at the presidential palace on Monday in Port-au-Prince, Haiti. Port-au-Prince, Haiti (CNN) -- Once there was a golf course and a swanky club. Almost two weeks after Haiti's killer quake, the sweeping hills of The Petionville Club have transformed into a city of misery. As many as 100,000 displaced Haitians are sleeping here at night, the largest camp in the Haitian capital. Monday, the aid agency Catholic Relief Services distributed food en masse for the first time here. "It was a grand slam," said CRS spokesman Lane Hartill. "It feels great. We need to get food to the people." Hartill said the camp was divided into quadrants, each marked with a color. People were handed colored tickets for food distribution. Monday was yellow-ticket day. The tickets, said Hartill, helped keep the massive distribution effort orderly; people felt confident food was on its way no matter where they stood in line or what color ticket they had. Soldiers from the U.S. Army's 82nd Airborne Division, who have set up camp at the top of the hill, helped haul the food and slid burlap bags down the hill on sheeting used as a chute. People with yellow tickets received a 100-pound sack of bulgur, lentils and cooking oil -- enough to feed a family of five for three weeks. Within minutes of the distribution, the smell of cooking wafted through the air. It's the first wave of a significant amount of food for thousands who have gone hungry since losing their homes and livelihoods in the magnitude-7.0 quake on January 12. As many as 150,000 people are feared dead and an estimated 1.5 million rendered homeless. Hartill said CRS, which has operated in Haiti since 1954, is spending $25 million in its aid operation here. The agency is focusing on food aid and has brought in about 90 shipping containers filled with food. No one knows how long this tent city will have to function, but Hartill said CRS will be implementing a work-for-food plan that will help get people back to their own neighborhoods -- even if it is in temporary shelters there -- to earn cash for cleaning up rubble and trash. Down the hill from the three-quarters-empty, blue-tiled pool and from the poolside bar that now says "pharmacy," Hartill walked through a maze of tents Monday. The 34-year-old air worker from Oregon said he had never worked on a humanitarian disaster on such a large scale. He said he found the encampment somewhat organized -- committees have formed to keep it running -- but still, risks of fire and other hazards exist. "When you have this many people living together, you are going to have problems," Hartill said. He said the next challenge will be to supply every resident of this vast camp with plastic sheeting. The rainy season is around the corner, and that will bring with it a whole new problem. The dusty hillsides will surely turn to mud. "It's going to turn into Woodstock out there," Hartill said.